Harvest Park Middle School is located in the central region of Pleasanton and serves students in grades six through eight following a traditional calendar. At the beginning of the 2010-11 school year, 1179 students were enrolled, including 10% in special education, 5% qualifying for English Language Learner support, and 5% qualifying for free or reduced price lunch. Harvest Park Middle School achieved a 2011 Academic Performance Index (API) score of 923. In the spring of each year, Harvest Park Middle School is required by the state to administer a physical fitness test to all students in grade five, grade seven, and grade nine. The physical fitness test measures each student’s ability to complete fitness tasks in six major areas. Students who either meet or exceed the standards in all six fitness areas are considered to be in the “healthy fitness zone.” The chart disclosed in the SARC reports only the percentage in each category, not a cumulative total of the results for categories 4 of 6 and 5 of 6. Comparative district and state results can be found at the CDE’s website. California uses the results of STAR testing to calculate the Academic Performance Index (API) which is used to measure school performance, set academic growth targets, and monitor progress over time. The API is a numeric index between 200-1000 that measures student performance in grades two through eleven. An API score of 800 is the state’s designated performance target for all schools. Test results are weighted and a formula is applied to determine API. Harvest Park Middle School achieved a 2011 Academic Performance Index (API) score of 923. Growth Targets: For schools with an API under 800, the state requires a gain of 5% of the difference between the school’s actual API and 800. Growth Targets apply not only school-wide, but to each numerically significant subgroup as well. Schools/subgroups that have achieved an API of 800 or above must maintain their scores. Statewide Rank: All schools in California are categorized according to type (elementary, middle, high) and are placed on a scale of 1 to 10, with 10 being the highest. Similar Schools Rank: School performance is also compared to other similar schools in the state, based on demographic characteristics, and ranked 1 to 10 within a grouping of 100 schools. Harvest Park scored a similar school rank of 7 based on 2008, 2008, and 2010 Base API Reports. The Federal No Child Left Behind Act (NCLB) requires that all students perform at or above the proficient level on the state’s standards-based assessment by the year 2014. Meeting Adequate Yearly Progress (AYP) milestones helps determine whether students are reaching proficiency level targets set by NCLB. AYP requires annual evaluation and reporting of the academic progress of all students and defined student subgroups. For the 2010-11 AYP cycle, elementary and middle schools must achieve a 67.6% or higher proficiency rate in all subgroup populations for English/Language Arts and 68.5% or higher proficiency rate in math on the California Standards Test (CST). Additional criteria contributing to whether or not a school demonstrates AYP include achieving a 95% or above participation rate on the CST and obtaining an API growth score of 710 or increasing the API growth by 1 point. More information on AYP can be found on the California Department of Education’s (CDE) website www.cde.ca.gov/nclb/ and the U.S. Department of Education’s website www.ed.gov/nclb/accountability/. These links will take you to external websites which are not hosted by or affiliated with PUSD. The No Child Left Behind (NCLB) Act is part of the Federal Title I funding program designed to support additional staffing and programs to meet the needs of low-income, low achieving students, and other designated students with special needs. Schools may apply, based upon their student demographics, for one of two types of Title I funding: Title I School-Wide or Title I Targeted Assistance. Title I School-Wide schools use federal funds for school-wide improvement of student achievement. Title I Targeted Assistance schools use federal funds to help those students who meet specific program criteria. In 2010-11, Harvest Park Middle School did not participate in the Title I program and is therefore not required to comply with program mandates. Any school receiving Title I funds is required to comply with respective program testing and reporting activities, achieve specific levels of student proficiency, and monitor school progress towards meeting established goals. California Adequate Yearly Progress calculations determine whether a Title I school has met performance goals. Schools not meeting specific AYP criteria enter Program Improvement, a monitoring system and curriculum enhancement program designed to help schools to increase student proficiency levels. More information about Title I and Program Improvement can be located on the CDE’s website www.cde.ca.gov/ta/ac/ti/. This link will take you to an external website which is not hosted by or affiliated with PUSD. Harvest Park is currently not participating in the Title I Program or in Program Improvement. Parents are encouraged to get involved in their child’s learning environment either by volunteering in the classroom, participating in a decision-making group, or simply attending school events. Parents stay informed on upcoming events and school activities through flyers, the school marquee, school newsletters, school website, teacher websites, eConnection, Coffee with the Principal, and weekly electronic newsletters. Contact the school office at (925) 426-4444 for more information on how to become involved in your child’s learning environment. Opportunities to Volunteer- We have many opportunities for Parent Volunteers on campus, and we could not offer many of our program without parental support. Please contact our PTSA President, Kristen Dean at Kristen@cadeans.com for more information, or visit the PTSA Website. This link will take you to an external website which is not hosted by or affiliated with PUSD. The district takes great efforts to ensure that all schools are clean, safe, and functional through proper facilities maintenance and campus supervision. Harvest Park Middle School’s original facilities were built in 1968; ongoing maintenance and campus improvements ensure facilities remain up to date and provide adequate space for students and staff. District maintenance and site custodial staff ensure that the repairs necessary to keep the school in good condition are completed in a timely manner. A work order process is used by school and district staff to communicate non-routine maintenance requests. The principal communicates with custodial staff daily concerning maintenance and school safety issues. The district’s maintenance department inspects Harvest Park Middle School on an annual basis in accordance with Education Code §17592.72(c)(1). Harvest Park Middle School uses a school site inspection survey to identify unsafe or hazardous conditions and facility improvement needs. The most recent school inspection took place on Thursday, September 08, 2011. Deficiencies noted in the school inspection survey were corrected immediately by the district’s maintenance department. During fiscal year 2010-11, all restrooms were fully functional and available for student use. Exemplary: The school meets most or all standards of good repair. Deficiencies noted, if any, are not signifcant and/or impact a very small area of the school. School administration and teaching staff place a high priority on providing adequate adult supervision on campus before, during, and after school. As students arrive on campus each morning, administrators, teachers, and campus supervisors patrol the campus, entrance areas, and designated common areas. Administrators and campus supervisors monitor lunch time activity in the cafeteria and common student activity areas. At the end of the day when students are dismissed, administrators, teachers, and campus supervisors monitor student behavior and ensure students either leave campus or travel to after-school activities in a safe and orderly manner. Harvest Park Middle School is a closed campus. During school hours, all visitors must sign in at the school’s office and wear identification badges while on school grounds. The Comprehensive School Site Safety Plan was developed for Harvest Park Middle School in collaboration with local agencies and the district office to fulfill Senate Bill 187 requirements. Components of this plan include child abuse reporting procedures, teacher notification of dangerous pupil procedures, disaster response procedures, procedures for safe arrival and departure from school, sexual harassment policy, and dress code policy. The school’s most recent school safety plan was reviewed, updated, and discussed with school staff in November 2011. Harvest Park Middle School’s discipline practices and behavior management strategies comply with approved board policies and are designed to create effective learning environments and minimize classroom disruptions. Progressive discipline and proactive measures are employed in the classroom for those students experiencing difficulty following school rules and demonstrating positive behavior. Disciplinary intervention is managed by school administrators in a fair, firm, and consistent manner based upon the nature of each situation. Decisions concerning selection of staff development activities are performed by all staff using tools such as teacher input, district benchmark results, and data analysis to determine the areas in which additional teacher training may enhance classroom instruction and increase student achievement levels. Harvest Park Middle School supports ongoing professional growth throughout the year on minimum days. Teachers meet in grade level teams to conduct data analysis to identify areas of need. Harvest Park Middle School offers support to new and veteran teachers through peer coaching and mentoring. Instructional aides are provided targeted training focused on teaching strategies and curriculum content. Substitute teachers are invited to participate in designated staff development activities. All staff are encouraged to attend professional workshops and conferences. Classified support staff receive job-related training from department supervisors and district representatives. All textbooks used in the core curriculum at Harvest Park Middle School are aligned to the California Content Standards and Frameworks. Instructional materials are selected from the state’s most recent list of standards-based materials and adopted by the State Board of Education. The district follows the State Board of Education’s six-year adoption cycle for core content materials (English/language arts, math, science, and social science). 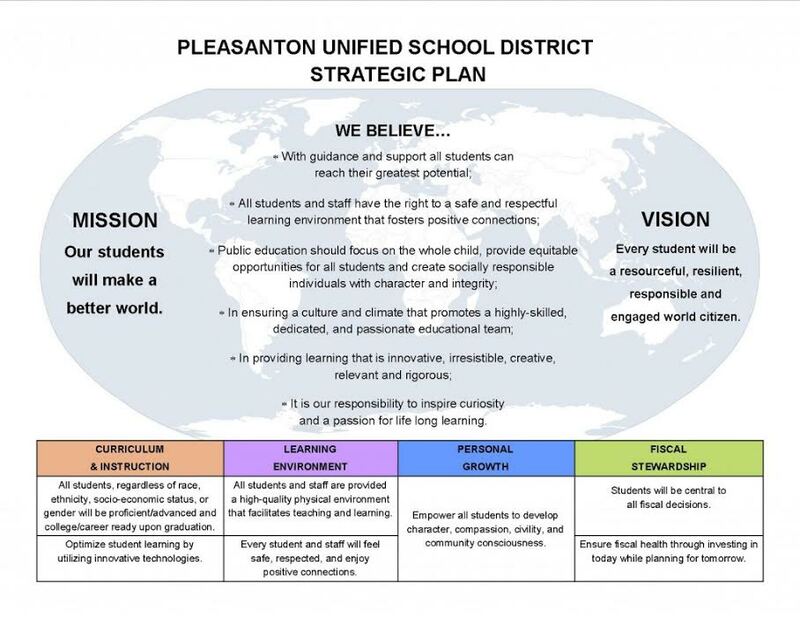 On Tuesday, September 13, 2011, the Pleasanton Unified School District’s Board of Trustees held a public hearing to certify the extent to which textbooks and instructional materials have been provided to students. The Board of Trustees adopted Resolution No. 2011.12.01 which certifies as required by Education Code §60119 (1) that textbooks and instructional materials were provided to all students, including English learners, in the district to the extent that each pupil has a textbook or instructional materials, or both, to use in class and to take home, and (2) sufficient textbooks and instructional materials were provided to each student, including English learners, that are aligned to the academic content standards and consistent with the cycles and content of the curriculum frameworks in math, science, history-social science, and English/language arts. In addition to core subject areas, districts are required to disclose in their SARCs the sufficiency of instructional materials used for their visual/performing arts curricula. During the 2011-12 school year, Pleasanton Unified School District provided each student, including English learners, enrolled in a visual/performing arts class with a textbook or instructional materials to use in class and to take home. These materials complied with the state’s content standards and curriculum frameworks. The textbooks and instructional materials used by the school are the most recently SBE adopted instructional materials. The administrative team is comprised of the principal and two vice principals, who work closely with the leadership team, teachers, the counselor, and school staff to provide a standards-based instructional program. Principal Ken Rocha is responsible for the day-to-day operations of the school and overall instructional program. The principal delegates supervisory responsibilities to the vice principals based upon individual strengths and expertise. The vice principals take a prominent role in managing student discipline, student activities, school facilities, school and student safety, and class scheduling. Also coordinating efforts with the Principal is the Leadership Team, comprised of the principal, vice principals, counselor, and department chairs. The Leadership Team meets regularly throughout the year to discuss instructional programs, staff development needs, and student achievement. During the 2010-11 school year, Harvest Park Middle School had 59 teachers who met all credential requirements in accordance with state guidelines. The Federal No Child Left Behind Act requires that all teachers in core subject areas meet certain requirements in order to be considered as “NCLB Compliant.” Minimum qualifications include: possession of a bachelor’s degree, possession of an appropriate California teaching credential, and demonstrated competence in core academic subjects. In the table below, which identifies the number of classrooms taught by NCLB-compliant and non-compliant teachers, high poverty schools are those schools in the highest quartile for student participation defined by the free and reduced price meal program. Low poverty schools are those schools that are in the lowest quartile of program participation. DataQuest is an online data tool located at http://dq.cde.ca.gov/dataquest/ that contains additional information about Harvest Park Middle School and comparisons of the school to the district, the county, and the state. DataQuest provides reports for school accountability, including but not limited to API, AYP, STAR results, enrollment, and staffing. This link will take you to an external website which is not hosted by or affiliated with PUSD. Parents may access Harvest Park Middle School’s SARC and access the internet at any of the county’s public libraries. The closest public library to Harvest Park Middle School is Pleasanton Public Library. This link will take you to an external website which is not hosted by or affiliated with PUSD.